THERE ARE FEW MORE CIVILISED CITIES THAN SEOUL. A metropolis of just over 10m people, yet it runs like the inside of expensive watch. It’s busy, but orderly; tightly inhabited, but not claustrophobic. Technology – particularly communication devices – is everywhere, so it is ironic the city’s only failure is to let the wider world know of its merits. The visitor has an easy ride here - and not just on the buses, which have leather reclining seats. The welcome is broad and genuine. Good manners appear to be the national sport. The drinking culture doesn’t come in one part, it takes a few forms: the traditional and the imported. Soju is obligatory. Indeed, a meal that is not washed down with a cry of ‘gun bae’ (‘cheers’) and the clink of green bottles – whether the world’s largest brand Jinro or Lotte’s Chum Churum – is a rare thing. But when it comes to top bars, soju has a peripheral role. Here we are talking international spirits, mostly scotch. 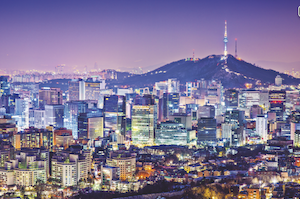 South Korea may be 5,000 miles from Scotland, with few apparent links or similarities, but Seoul is one of the easiest places to drink scotch on the planet. Not so long ago it might have been bottles of blended whiskies that festooned the walls of the city’s best lounge-style bars, but single malts now provide the decoration. If there is a dominant drinking trend right now, it would be single malts. Cocktail culture is not far behind. According to Jackey Yoo, World’s 50 Best Bars Academy member, the embracing of single malts has changed the bar dynamic in Seoul. Where once blended whisky was bought a bottle at a time and shared among friends, the diversity of single malts – which are often served by the glass – has drawn punters to the bar, which is increasingly where cocktails are made. Naturally, scotch cocktails are the favourites and are popular in dozens of bars across the city. If there is a difference of approach here to elsewhere, it is that bartenders do not just use blends and entry-point single malts in their mixes – here there are no qualms about aged scotch in cocktails. It’s early days but there are a good number of bars that are making cocktails equal to the venerable single malts that form their base. Technique wise, bartenders tend to look east to Japan but, unlike their neighbour country across the sea, there is not a master-apprentice graduation system. Bar managers in Seoul did not have to wait a generation for their chance. According to Yoo, a far more valued measure of development here can be seen in the large cocktail competitions, World Class and Pernod Ricard Bartender Championship. Many of the new bar owners have achieved financial backing after winning such competitions. In a city so big, it’s hard to cover it all, so here are five bars from south of the Han river. A word of warning, some bars have cover charges of $5-$10 – shrug it off as the Korean equivalent of a tip.